The very promising and exciting Triple Crown 2yo, Jericho (by Smart Missile), is lining up in tomorrow’s Listed Phoenix Stakes at Eagle Farm over 1400m with gun jockey Blake Shinn booked to ride. Following a slashing run from the tail of the field to finish 2nd (by a half head) in his most recent outing in the Listed Hampden Stakes, Jericho will be looking to go one better over his rival Archives. Jericho looked to have Archives’ measure when they last met until Jericho showed his inexperience in the last 100m by laying in and doing a few things wrong. Trainers Peter and Paul Snowden have elected to apply winkers to his raceday gear tomorrow in an attempt to iron out any chinks in the amour. The team couldn’t be happier with the way Jericho has trained on since his last start so we are expecting another bold showing. The Brisbane weather is threatening an enormous amount of rain over the next day or two, so the wet track, for Eagle Farm’s first race meeting, will present the big unknown on the day. Fingers crossed the talented youngster can handle the wet track not to mention the shocking barrier of 15 out of 15. The Triple Crown team will also be represented tomorrow with runners at Rosehill and Sandown. 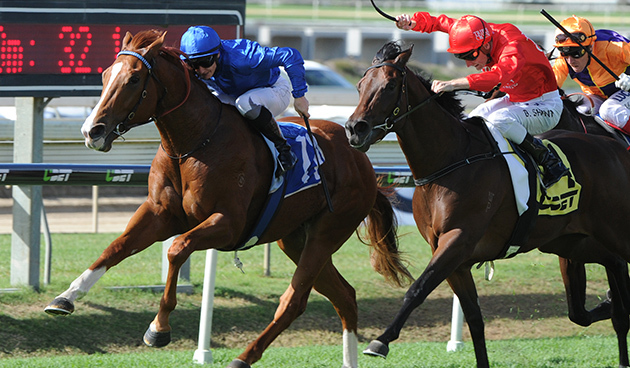 Rock Mylady will be lining up at Rosehill in race 7 the Monaco Cup over 1500m. Now that he has matured we think this stayer is certainly looking for a longer journey ie 2000m however the blinkers go back on tomorrow and he has drawn a good gate in barier 4 and Thomes Huet takes the ride. The speedster Belesron will take his place in the final race at Sandown with Damian Oliver on board and from the wide gate of 11. Belesron has already won in excess of $140,000 in prizemoney to date and with some luck from the tricky barrier he should be capable of adding to that tally. Best of luck to our owners!